Hank and Maggie Skewis are veterans who have been offering Pinot Noir from the Russian River Valley, Sonoma Coast and Anderson Valley since 1994. That year, grower Fred Peterson of the Floodgate Vineyard in Anderson Valley (now owned by Goldeneye and renamed) offered enough grapes to make 70 cases. Today, Hank crafts less 900 cases annually of Pinot Noir working out of a shared crush facility. The emphasis is on low yields from vineyards located in premium growing regions. The average crops in the vineyards that are contracted yield on average of 2 to 2.5 tons per acre. In the winery, grapes are de-stemmed, fermented with a significant percentage of whole berries, fermented warm for maximum extraction of color, phenolics and complexity, then pressed into French oak barrels for 18 months. Bottled unfined and unfiltered, the wines are aged an additional 6+ months in bottle before release in October of each year. Vineyard sources have changed through the years but quality has always remained high. 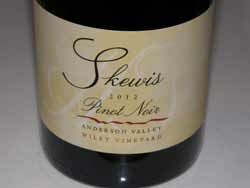 The 2012 Pinot Noir from Wiley Vineyard in the Anderson Valley is the first release by Skewis from this vineyard. The wines typically age extremely well. The wines are sold on the winery’s website at www.skewis.com, through a mailing list, and through limited distribution in Northern California. 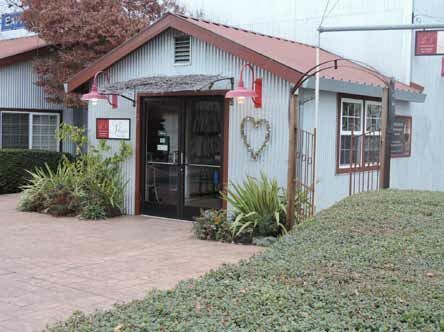 A quaint tasting room (pictured below) is open Friday through Sunday at 57 Front Street in the historic Old Roma Station Winery complex in Healdsburg. On Saturdays from 11:00 to 4:30, a complimentary shuttle from the Healdsburg Plaza (across the street from Dry Creek Kitchen) to the Old Roma Station and adjacent Hudson Street Wineries is offered. Tasting is available on other days by appointment.